Microsoft has announced the Xbox Games with Gold lineup for December 2018. Subscribers on Xbox One from December 1 to 31 can get a free copy of Q.U.B.E. 2. Step into the shoes of Amelia Cross, a British archaeologist, who has awoken on a strange alien planet. With the help of fellow survivor, Emma, players must face the challenging puzzles of the Q.U.B.E. in order to try and find a way back home. The second free title for Xbox One members, available December 16 to January 15, is Never Alone. Delve into the rich lore and culture of the Iñupiat people in this unique adventure game. Play as a young Iñupiat girl and an arctic fox to find the source of the eternal blizzard which threatens everything. 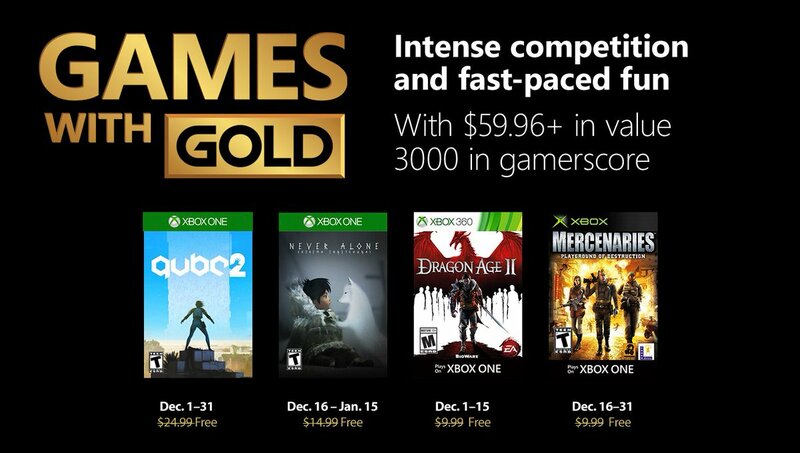 For subscribers on Xbox One and Xbox 360, from December 1 to 15 you can download Dragon Age II. This sequel continues the adventure with a new hero, Hawke, and utilizes the choices made by the player to affect a story that spans ten years worth of time in-game. Lastly, from December 16 to 31 on Xbox One and Xbox 360, members can download Mercenaries: Playground of Destruction from the original Xbox. Your mission is to topple a sinister military regime by any means necessary.